"It won't work right if it's not installed right" is more than a phrase, it is the guiding philosophy of AWDI and its operations. In today's climate of performance enhancing innovation and testing of window products, the quality and value of the majority of residential window and door products is not in doubt. It is the installation of the product, in a new or existing opening, that is at least equal in importance to any other facet in the ultimate satisfaction of the homeowner. Window and Door products have become more sophisticated, and have become, in effect, precision appliances - able to separate and control the interior environment independent from the outside environment; while being able to operate reliably for long periods of time. The AWDI Standards Version 1.3.2 seeks to create consistent installations, utilizing consistent products, in inconsistent applications. Therefore, the AWDI Installation Certification Program is given with an eye on instructing the installer on the ways to create the "consistent opening" ready to accept the new window; and teaching the installer how to remove the opportunities for mistakes rather than just avoiding them. How to Apply for AWDI Certification at Special $149.00 Rate! Press the "BUY NOW" Button which will submit your request to AWDI with your payment of $149.00. 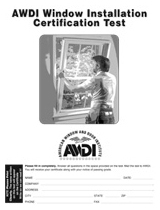 This is a special rate for Internet Certification and awards Level II Certification for Replacement Windows. There must be a separate submittal for each installer. (For quantities of 10 or more, contact AWDI). We will mail all your materials 2-Day Priority Mail. Once you have completed the test, return it to AWDI, LLC along with a cover letter with 3 references (Customers, Suppliers, etc.). If you pass (100 questions right out of the 120), you will be sent your Certificate, your Membership Card, and an Embroidered Patch for your hat, jacket or shirt, and you will be added to the AWDI.com database. The test has 120 questions covering material in the Standards and Guidelines and the Installation Manual. This test must be returned to AWDI for grading. 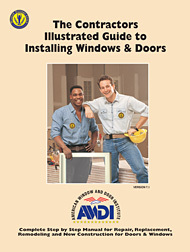 WINDOW FITTERS GUILD- AWDI, LLC.